Barton Swaim had gisteren in The Wall Street Journal July 25, 2014 een book review: 'Nature's God' by Matthew Stewart & 'Independence' by Thomas P. Slaughter. Was America's revolution driven by political philosophers, or practical men reacting to events? De reviewer heeft zich niet laten overtuigen en is enigszins kritisch over Stewart's verhaal. "In Mr. Stewart's telling, the central tenets of "philosophical radicalism" worked their way into the Declaration of Independence and the Constitution by a kind of ideological stealth. When, for example, Jefferson referred in the first paragraph of the Declaration to "the separate and equal station to which the Laws of Nature and of Nature's God entitle" a nation, he wasn't just offering a palatable conception of deity to his religious or nominally religious readers. He was drawing on a radical tradition stretching back to John Locke and especially to the Dutch rationalist Baruch Spinoza, who himself had drawn on the ancient Greek philosophers Epicurus and Lucretius. Similarly, radical ideas about suffrage and religious disestablishment earned attention among the nation's Founders primarily through the efforts of a few radical atheists—or perhaps the word is pantheists—such as the Vermonters Thomas Young and Ethan Allen." Zie in de reacties bij dit blog van 28 maart 2014 andere recensies. 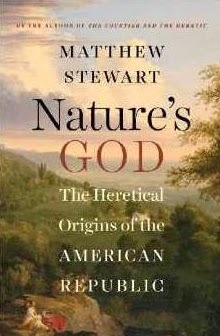 Op 22 juli 2014 had op MRB Radio #14 Art Remillard talks with Matthew Stewart about his new book, Nature’s God: The Heretical Origins of the American Republic. Het is zo'n irritant onderwatergeluid via de telefoon of skype o.i.d. Vorig artikelWint er vandaag wel een stoute?